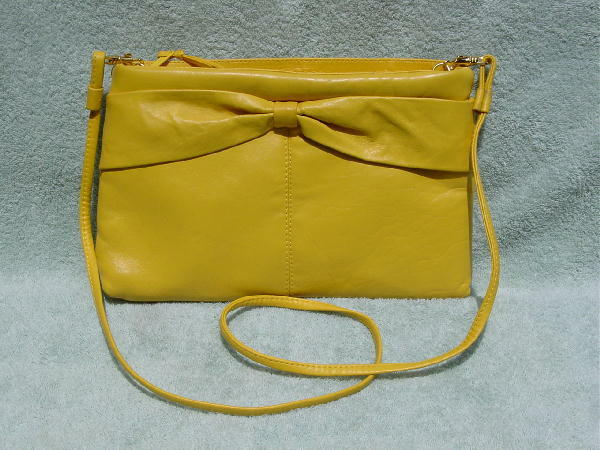 This vintage never used faux leather purse is in a deep sunflower yellow. It has a top side to side zipper and a detachable 44" long shoulder strap so you can carry it as a clutch. It has a faux bow across the front top. There is a bone color thick fabric lining and a big interior zippered pocket. It's from a former California model. She bought it in the early 1980s to wear on a cruise. She forgot to pack it.